Canadians for Ethical Treatment of Food Animals (CETFA) is an investigative and educational organization established to examine intensive farming practices. 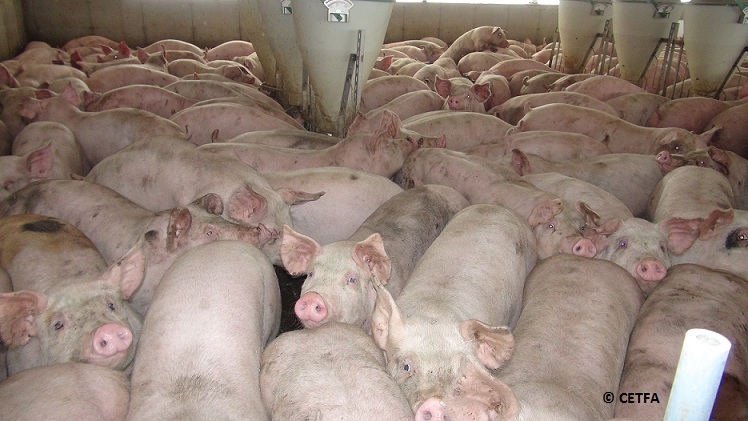 Justice was a domestic pig born in a massive sow operation to a mother trapped within a steel and concrete “gestation crate” (actual barn pictured below). After just 2-3 weeks with his mother, Justice was moved to a grow-out facility (pictured below). There he lived in an overcrowded, filthy shed infested with mice and flies until CETFA investigators discovered him. What follows is the account of the 2 CETFA investigators who found and rescued Justice – Sue Manns and Nicole Joncas. 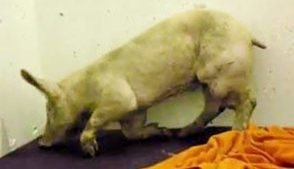 On a routine visit of what became a 7 month investigation at a large Ontario pig operation, I discovered a pig who was lying down and seemed unable to rise. He appeared thin and his left-side rear and front legs had what appeared to be extremely large abscesses on them. It was clear he was in severe pain and urgently needed help. I quickly returned with Nicole Joncas, founder of Teja’s Animal Refuge, and 2 others willing to help load the suffering pig. We decided to name him Justice. Justice remained in the same spot as when I’d left. From earlier visits I knew that if left, Justice would soon die like the others who languished in pain for days before they died. He’d also likely be scavenged upon by the other overcrowded and stimulation-deprived pigs (just as the poor pig in the pen next to Justice was while we were removing him). We managed to move Justice out of that horrible, filthy barn into a van where he was given fresh fruit and vegetables, which he ate for the first time in his life. Back at Teja’s, Justice was given a soft blanket, fresh water and grain and was examined. We now saw that the growths on his limbs and feet were oozing pus. 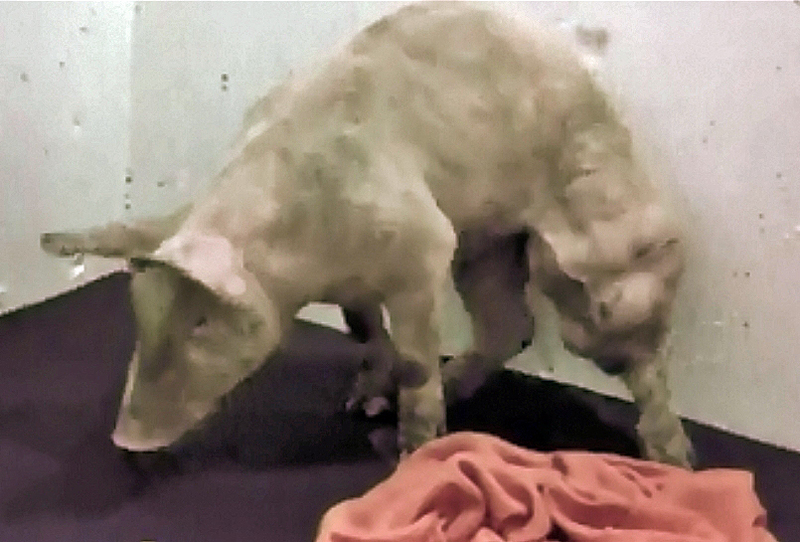 When the veterinarian saw Justice, he immediately knew he was a factory farm pig from his condition. The vet stated that Justice was in enormous pain and that the best we could do for him was to put an end to his suffering. We made the difficult decision to euthanize Justice. Justice’s life was one filled with pain and misery, but at least he didn’t have to die in that horrible barn. He died with dignity, without being trampled to death or eaten, and he had a taste of fresh fruit, a warm bed, and kindness – something some 21 million other pigs in Canada will never experience. No animal should have to live as Justice did. Don’t be a part of the cruelty. Take a stand for pigs like Justice and boycott pork. Canadians for the Ethical Treatment of Food Animals (CETFA) is an investigative and educational organization established to examine intensive farming practices, with particular attention to abusive practices; hazards to human health; environmental impacts; and the role of power politics in maintaining the system while withholding public access to factual information. We seek to address these interconnected issues through investigation, education and advocacy of the compassionate treatment of farmed animals. 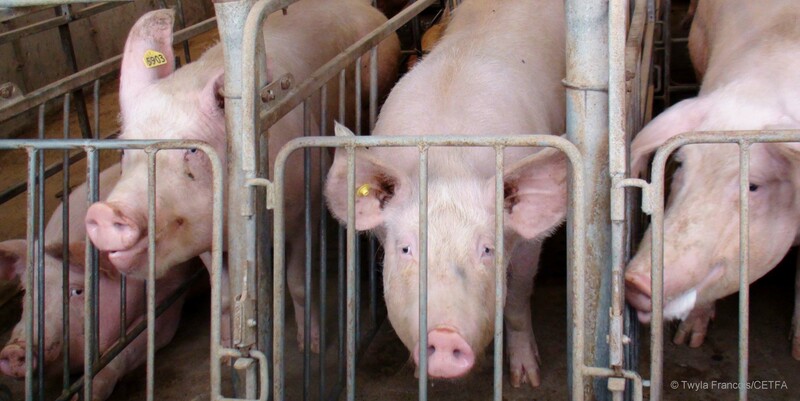 This entry was posted in From the Field and tagged animal cruelty, CETFA, factory farm, Ontario, pig, pork. Bookmark the permalink. I think they probably process these pigs as well. It’s disgusting. It’s absolutely horrible to treat the very animals who you should be so respectful to for eating, like they have no value. Carnivore, vegetarian, vegan – it is APPARENT and OBVIOUS that this isn’t the way we should be raising these creatures. This is hard to look at but it is something that people need to see and understand what is really going on, no animal should ever live with such suffering. Thank you to everyone who had any part of this, rest in peace Justice. Reblogged this on Schwein gehabt?. I have tears in my eyes…thx for the sahre of this beautifull story. I hope one day all the pigs like Justice will have a taste of fresh fruits and grain and a warm blanket to sleep on.As well as of any other living animal on this earth. Thank you for your kind comments, Sherry. Thank you so much. We will check your blog.